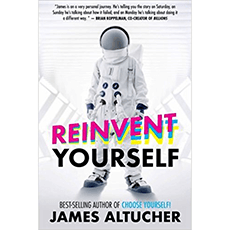 In “Reinvent Yourself”, James Altucher explains the importance of reinvention to ensure positive outcomes in your life. He offers techniques to master your reinvention skills in a world that is constantly changing in order to always be prepared for new opportunities and success. 2. It’s Going To Be A Storm! Do You Have An Umbrella? 7. The Tao of Louis C.K. 42. Do You Make Fear Decisions Or Growth Decisions?